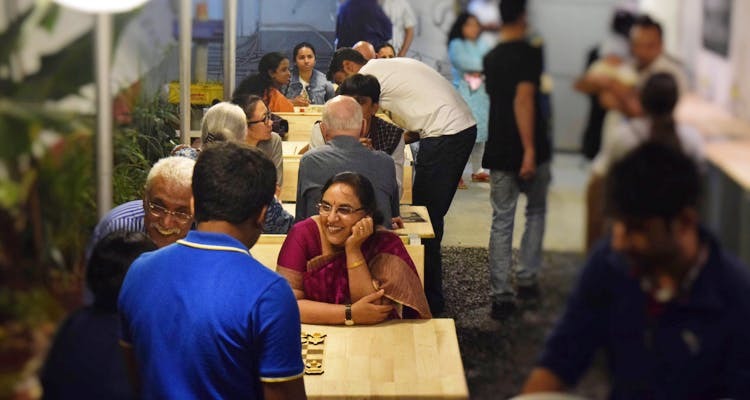 Enjoy a hearty meal over some interesting games at Workbench Project’s recently-opened cafe. A fun co-working space for innovators, Workbench Projects is all about bringing the DIY and maker culture to the city. Founded by Pavan Kumar and Anupama Prakash, this place has one more reason for us to head there now (apart from the artistic vibes, of course). Collaborating with Ants Cafe, their newly-opened WP Cafe serves continental food and a selection of drinks. And, lets you play a game or two while you wait for your meal! With a neatly arranged garden nearby and artworks on the walls, the cafe’s seating includes wooden tables, benches and stools, all made in their workshop. Based on Ants Cafe’s philosophy of healthy food, their menu has similar dishes (following Ants’ recipes), prepared in-house by the folks at WP. Start off with cold coffees like Brownie Sliced Frappe or Hazelnut Frappe, flavoured iced teas or smoothies (Chocolate, Mango and Mixed Fruit). Apart from short eats (good old French Fries to Sausages with Bell Peppers), salads and omelettes, they offer filling breakfast options which could be as simple as the Eggs, Bacon and Toast or an elaborate English Breakfast. Sandwiches and pastas with vegetarian and non-vegetarian options, and mains like Paella, Pesto Chicken and Fish Fillet will spoil you for choice here. Their tabletops come inscribed (using laser engraving or 3D printing) with familiar games, but with a ‘foodie twist’. Expect a game of Snakes & Ladders which will have healthy food to take you up the steps and junk food to pull you down. Or an equally interesting variation of Tic Tac Toe with coffee beans and cups. A game of chess here will have pieces with images of french fries, pizzas, burgers and hot dogs. If that sounds interesting, we suggest you make lunch plans already!